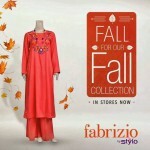 After the getting well popularity in foot-wear range Stylo has introduced clothing collection with the name of “Fabrizio by Stylo” in 2012. 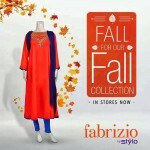 Recently, Fabrizio by Stylo has launched stylish and fancy suits for fall-winter season. For wedding functions and party occasions, these fancy dresses can be introduced. 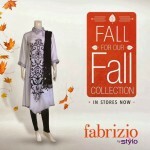 Stylo has got huge fame and success during the launching Fabrizo in recent years. 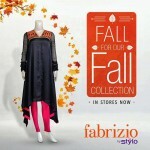 They take a start of winter collection with Party Wear Designer Era’s. This newest seasonal collection consists of simple shirts, long shirts, flair frocks with tights, pajama, trouser and lehenga. These dresses are made with chiffon, Georgette and silk fabrics which is the wedding functions elegance. A simple and unique fancy embellishments of sophisticated embroidery work makes these dresses fancier and stylish. Nowadays these dresses are available at their all leading stores and today they have royal costumers just because of their finest quality fabrics and gorgeous prints. 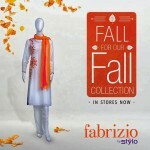 Just stay there are look complete collection of Fabrizio by Style.